Imagine the hollow halls of a redwood forest, ruddy pillars barked and bare of branches, the air redolent with decaying wood and clouded with fog. Distant sounds of traffic and voices fall away under the hush of a light rain. Ferns quiver under the condensing moisture that drips from frond tips in irregular beats. You are among giants, and their heights vanish in a sky lit by a sun hung somewhere above the impenetrable fog. A wind rises and the clouds clear, the trunks become illuminated by beams of light, limbs branch hundreds of feet off of the ground and crowns higher still, and laurels rest atop the tallest trees on earth. Few places in the world command the awe of a redwood grove in Redwood National and State Parks. The collective of Redwood National Park and Prairie Creek Redwoods, Del Norte Coast Redwoods and Jedediah Smith Redwoods State Parks along northern California’s Pacific coast is home to some of the finest forest scenery in the world. Delving into this international biosphere reserve is a must for anyone who appreciates forest beauty. Prior to Euro-American inhabitation, the Yurok, Tolowa, Karok, Chilula and Wiyot Native American tribes lived in the northern coastal region of modern-day California. Jedediah Smith was the first explorer of European descent to reach the area of the redwoods in 1828. The westward exploration and settlement by Europeans brought gold prospecting to the area, eventually turning to logging interests when gold prospects diminished. Originally over 2 million acres of redwood forest, extensive logging in the area stoked conservationist interests in the early 20th century. The first endowment of land that would become Prairie Creek State Park was donated in 1923. 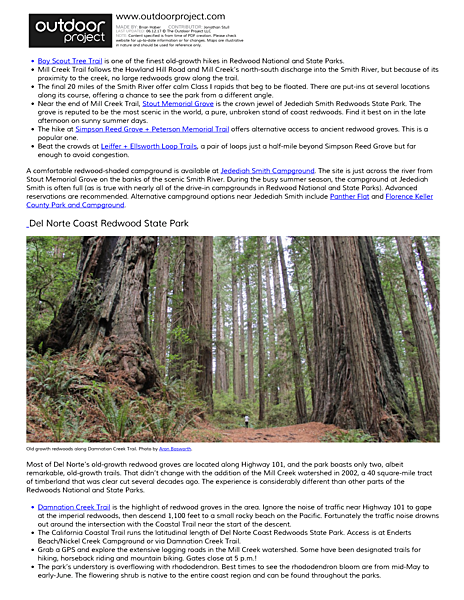 In 1925, Del Norte Coast Redwoods State Park was established. Jedediah Smith Redwoods State Park, situated along the banks of the Smith River, was established in 1939. Redwood National Park followed later in the century, established in 1968 across sections of both Del Norte and Humboldt Counties. 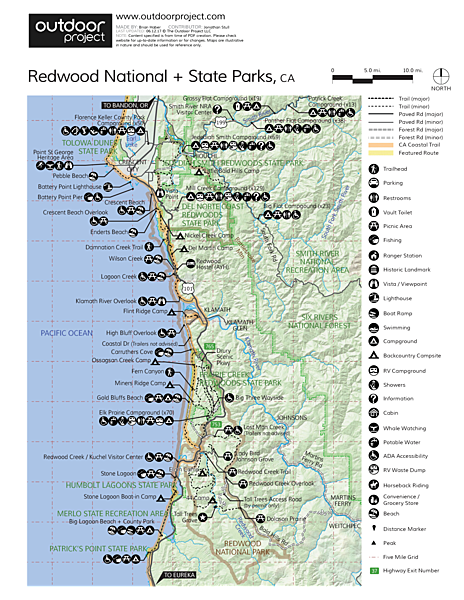 In 1994, in an effort to create greater protection and to enhance ecological corridors for over 105,000 acres of redwood forest, the National Park Service and California State Parks decided to combine management of Redwood National Park and the three state parks. The coast redwood, Sequoia sempervirons, is the tallest species of single-stem tree on earth, and the tallest tree on earth grows in Redwood National and State Parks. A combination of factors contributes to its sheer size. Heavy seasonal rains, cool ocean air and fog keep the trees consistently wet throughout the year. Thick bark rich in tannins keep them safe from fire damage and pests—and in fact, severe fires have been proven to remove competing species. The giants also rely on an ecosystem of decomposition to restore adequate soil nutrients that the trees need to survive and thrive. In many places these trees grow well over 300 feet tall (the tallest reaching heights close to 400 feet) and can live up to and beyond 2,000 years of age. Some of these groves have been disclosed publicly—they can be visited in the parks today. However, in recent years efforts to explore the old-growth trees have revealed groves of trees found to exceed even the tallest recorded measurements. In the interest of preservation, the locations of these groves have not been revealed. Excessive visitation can cause root damage, which can cause the crown of a redwood to die back. Today visitors can easily experience the beauty of old-growth coast redwoods by visiting any or the combination of Redwood National and State Parks. Highways 199, 101 and the Newton B. Drury Parkway pass right through a series of the gargantuan groves and provide direct access heading north to south. To fully experience the grandeur and resounding peacefulness endemic to the ancient redwood groves, it should be noted, one should step away from the car and wander out into the woods. Exploring the Boy Scout Tree Trail. Photo by Kyler Smith. While Redwood National Park to the south has many of the world’s tallest trees, Jedediah Smith Redwoods State Park has some of its largest by volume, dwarfed only by a handful of giant sequoias along the western slope of California’s Sierra Nevada. At 10,000 acres, it is the smallest of the parks, and it is also one of the least developed. Only two trails cross the park’s interior. Nevertheless, the park offers towering redwoods of a size known in few other places on earth. This is the home of the storied Grove of Titans, where grow the largest, third-largest and sixth-largest redwoods by volume. This is also the home of the Smith River, a federally designated Wild and Scenic River, which flows through much of the the park and connects the groves with the sea. Boy Scout Tree Trail is one of the finest old-growth hikes in Redwood National and State Parks. Mill Creek Trail follows the Howland Hill Road and Mill Creek’s north-south discharge into the Smith River, but because of its proximity to the creek, no large redwoods grow along the trail. The final 20 miles of the Smith River offer calm Class I rapids that beg to be floated. There are put-ins at several locations along its course, offering a chance to see the park from a different angle. Near the end of Mill Creek Trail, Stout Memorial Grove is the crown jewel of Jedediah Smith Redwoods State Park. The grove is reputed to be the most scenic in the world, a pure, unbroken stand of coast redwoods. Find it best on in the late afternoon on sunny summer days. The hike at Simpson Reed Grove + Peterson Memorial Trail offers alternative access to ancient redwood groves. This is a popular one. Beat the crowds at Leiffer + Ellsworth Loop Trails, a pair of loops just a half-mile beyond Simpson Reed Grove but far enough to avoid congestion. A comfortable redwood-shaded campground is available at Jedediah Smith Campground. The site is just across the river from Stout Memorial Grove on the banks of the scenic Smith River. 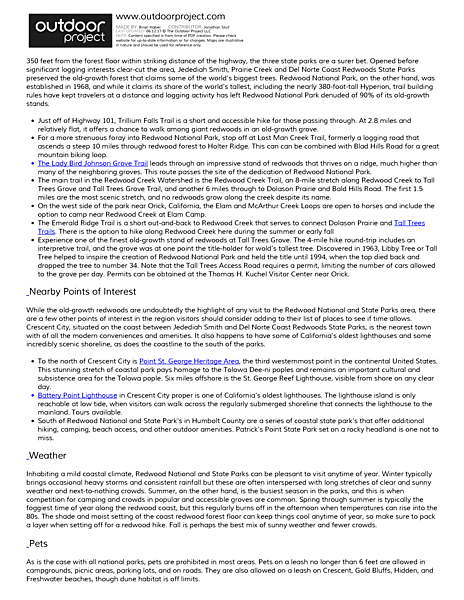 During the busy summer season, the campground at Jedediah Smith is often full (as is true with nearly all of the drive-in campgrounds in Redwood National and State Parks). Advanced reservations are recommended. Alternative campground options near Jedediah Smith include Panther Flat and Florence Keller County Park and Campground. Old growth redwoods along Damnation Creek Trail. Photo by Aron Bosworth. Most of Del Norte’s old-growth redwood groves are located along Highway 101, and the park boasts only two, albeit remarkable, old-growth trails. That didn’t change with the addition of the Mill Creek watershed in 2002, a 40 square-mile tract of timberland that was clear cut several decades ago. The experience is considerably different than other parts of the Redwoods National and State Parks. Damnation Creek Trail is the highlight of redwood groves in the area. Ignore the noise of traffic near Highway 101 to gape at the imperial redwoods, then descend 1,100 feet to a small rocky beach on the Pacific. Fortunately the traffic noise drowns out around the intersection with the Coastal Trail near the start of the descent. The California Coastal Trail runs the latitudinal length of Del Norte Coast Redwoods State Park. 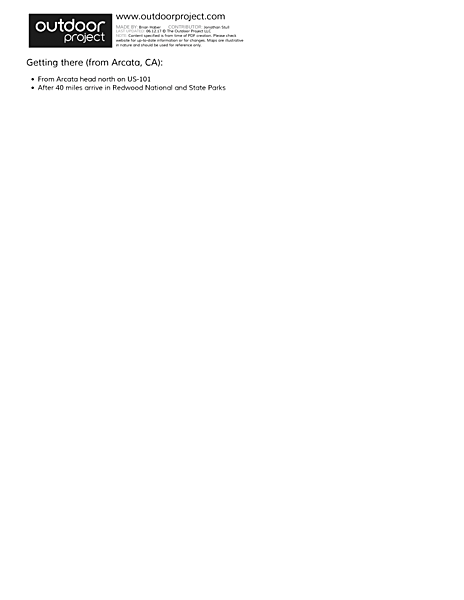 Access is at Enderts Beach/Nickel Creek Campground or via Damnation Creek Trail. Grab a GPS and explore the extensive logging roads in the Mill Creek watershed. Some have been designated trails for hiking, horseback riding and mountain biking. Gates close at 5 p.m.! The park’s understory is overflowing with rhododendron. Best times to see the rhododendron bloom are from mid-May to early-June. The flowering shrub is native to the entire coast region and can be found throughout the parks. Camp at Mill Creek Campground, sequestered from Highway 101 near the Mill Creek logging roads. Isolated from the highway, it receives far less noise than other campgrounds in the park. Campsites are also available at DeMartin Campground along the Coastal Trail in the southern part of Del Norte. The Coastal Trail in this section offers a different perspective of the coastal woodland—brighter, more open tracts of alder, spruce and fir. Nickel Creek is an option as well, a primitive campground right on the coast due west of Mill Creek Campground. The verdant hallways of Fern Canyon. Photo by Aron Bosworth. The original park of Redwoods National and State Parks to first protect the ancient redwoods, Prairie Creek may also be the most diverse in terms of natural features that are sure to pique the interest of visitors. 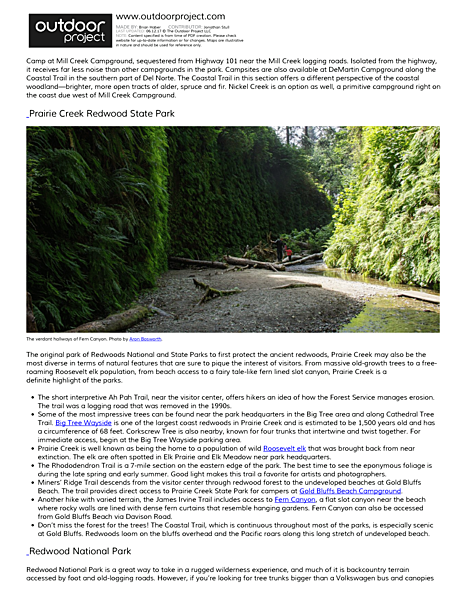 From massive old-growth trees to a free-roaming Roosevelt elk population, from beach access to a fairy tale-like fern lined slot canyon, Prairie Creek is a definite highlight of the parks. The short interpretive Ah Pah Trail, near the visitor center, offers hikers an idea of how the Forest Service manages erosion. The trail was a logging road that was removed in the 1990s. Some of the most impressive trees can be found near the park headquarters in the Big Tree area and along Cathedral Tree Trail. Big Tree Wayside is one of the largest coast redwoods in Prairie Creek and is estimated to be 1,500 years old and has a circumference of 68 feet. Corkscrew Tree is also nearby, known for four trunks that intertwine and twist together. For immediate access, begin at the Big Tree Wayside parking area. Prairie Creek is well known as being the home to a population of wild Roosevelt elk that was brought back from near extinction. The elk are often spotted in Elk Prairie and Elk Meadow near park headquarters. The Rhododendron Trail is a 7-mile section on the eastern edge of the park. The best time to see the eponymous foliage is during the late spring and early summer. Good light makes this trail a favorite for artists and photographers. Miners’ Ridge Trail descends from the visitor center through redwood forest to the undeveloped beaches at Gold Bluffs Beach. The trail provides direct access to Prairie Creek State Park for campers at Gold Bluffs Beach Campground. 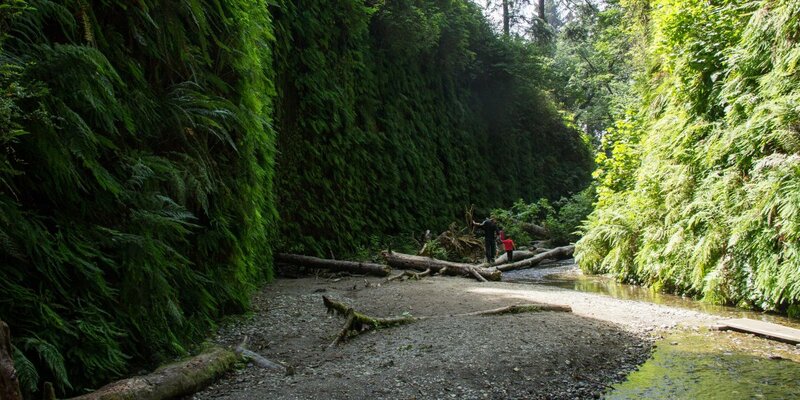 Another hike with varied terrain, the James Irvine Trail includes access to Fern Canyon, a flat slot canyon near the beach where rocky walls are lined with dense fern curtains that resemble hanging gardens. Fern Canyon can also be accessed from Gold Bluffs Beach via Davison Road. Don’t miss the forest for the trees! The Coastal Trail, which is continuous throughout most of the parks, is especially scenic at Gold Bluffs. Redwoods loom on the bluffs overhead and the Pacific roars along this long stretch of undeveloped beach. Redwood National Park is a great way to take in a rugged wilderness experience, and much of it is backcountry terrain accessed by foot and old-logging roads. However, if you’re looking for tree trunks bigger than a Volkswagen bus and canopies 350 feet from the forest floor within striking distance of the highway, the three state parks are a surer bet. Opened before significant logging interests clear-cut the area, Jedediah Smith, Prairie Creek and Del Norte Coast Redwoods State Parks preserved the old-growth forest that claims some of the world’s biggest trees. Redwood National Park, on the other hand, was established in 1968, and while it claims its share of the world’s tallest, including the nearly 380-foot-tall Hyperion, trail building rules have kept travelers at a distance and logging activity has left Redwood National Park denuded of 90% of its old-growth stands. Just off of Highway 101, Trillium Falls Trail is a short and accessible hike for those passing through. At 2.8 miles and relatively flat, it offers a chance to walk among giant redwoods in an old-growth grove. For a more strenuous foray into Redwood National Park, stop off at Lost Man Creek Trail, formerly a logging road that ascends a steep 10 miles through redwood forest to Holter Ridge. This can can be combined with Blad Hills Road for a great mountain biking loop. The Lady Bird Johnson Grove Trail leads through an impressive stand of redwoods that thrives on a ridge, much higher than many of the neighboring groves. 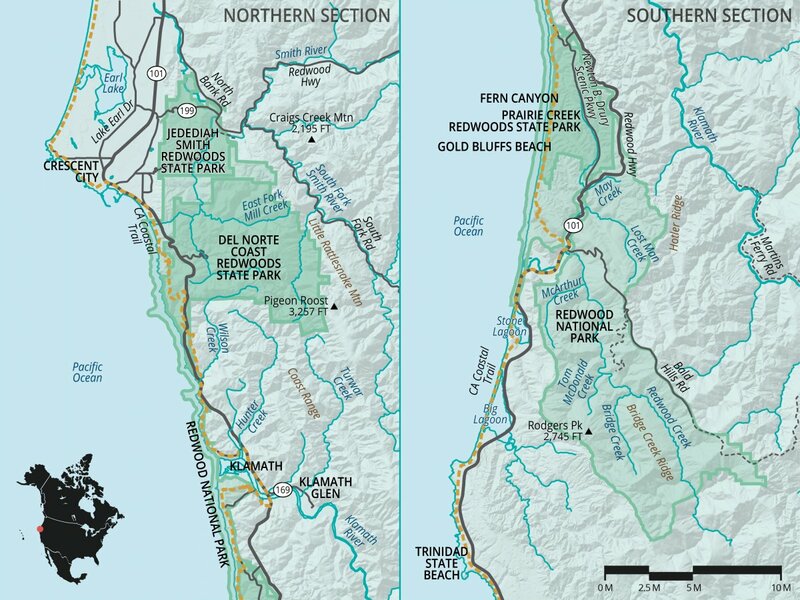 This route passes the site of the dedication of Redwood National Park. 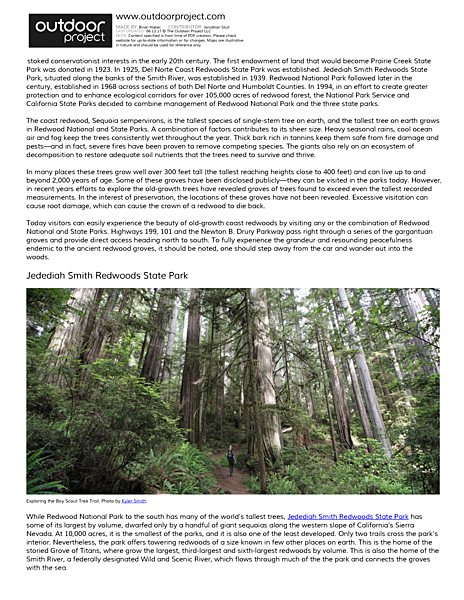 The main trail in the Redwood Creek Watershed is the Redwood Creek Trail, an 8-mile stretch along Redwood Creek to Tall Trees Grove and Tall Trees Grove Trail, and another 6 miles through to Dolason Prairie and Bald Hills Road. The first 1.5 miles are the most scenic stretch, and no redwoods grow along the creek despite its name. On the west side of the park near Orick, California, the Elam and McArthur Creek Loops are open to horses and include the option to camp near Redwood Creek at Elam Camp. 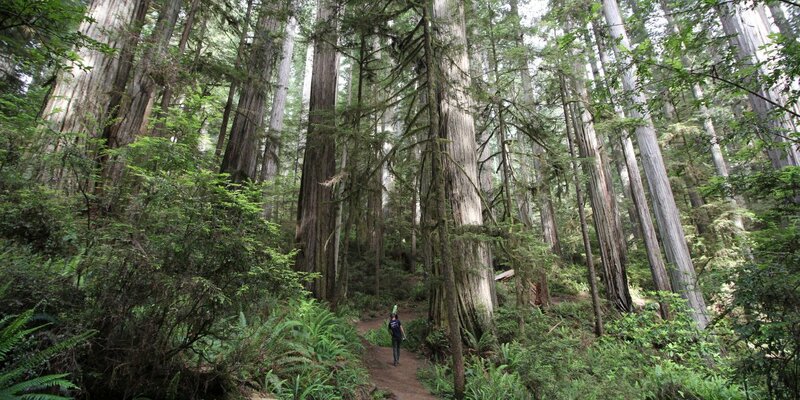 Experience one of the finest old-growth stand of redwoods at Tall Trees Grove. The 4-mile hike round-trip includes an interpretive trail, and the grove was at one point the title-holder for wold’s tallest tree. Discovered in 1963, Libby Tree or Tall Tree helped to inspire the creation of Redwood National Park and held the title until 1994, when the top died back and dropped the tree to number 34. Note that the Tall Trees Access Road requires a permit, limiting the number of cars allowed to the grove per day. Permits can be obtained at the Thomas H. Kuchel Visitor Center near Orick. 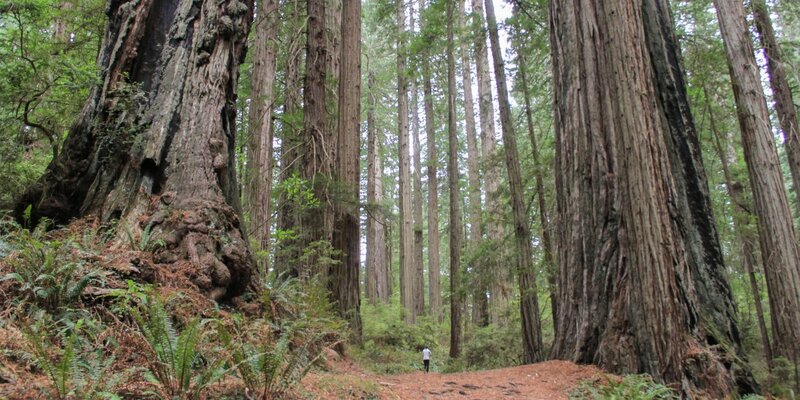 While the old-growth redwoods are undoubtedly the highlight of any visit to the Redwood National and State Parks area, there are a few other points of interest in the region visitors should consider adding to their list of places to see if time allows. Crescent City, situated on the coast between Jedediah Smith and Del Norte Coast Redwoods State Parks, is the nearest town with of all the modern conveniences and amenities. It also happens to have some of California's oldest lighthouses and some incredibly scenic shoreline, as does the coastline to the south of the parks. To the north of Crescent City is Point St. George Heritage Area, the third westernmost point in the continental United States. This stunning stretch of coastal park pays homage to the Tolowa Dee-ni poples and remains an important cultural and subsistence area for the Tolowa pople. Six miles offshore is the St. George Reef Lighthouse, visible from shore on any clear day. Battery Point Lighthouse in Crescent City proper is one of California's oldest lighthouses. The lighthouse island is only reachable at low tide, when visitors can walk across the regularly submerged shoreline that connects the lighthouse to the mainland. Tours available. 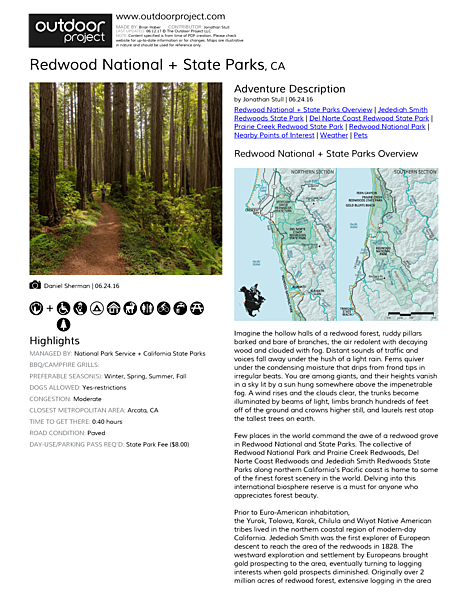 South of Redwood National and State Park's in Humbolt County are a series of coastal state park's that offer additional hiking, camping, beach access, and other outdoor amenities. Patrick's Point State Park set on a rocky headland is one not to miss. Inhabiting a mild coastal climate, Redwood National and State Parks can be pleasant to visit anytime of year. Winter typically brings occasional heavy storms and consistent rainfall but these are often interspersed with long stretches of clear and sunny weather and next-to-nothing crowds. Summer, on the other hand, is the busiest season in the parks, and this is when competition for camping and crowds in popular and accessible groves are common. Spring through summer is typically the foggiest time of year along the redwood coast, but this regularly burns off in the afternoon when temperatures can rise into the 80s. The shade and moist setting of the coast redwood forest floor can keep things cool anytime of year, so make sure to pack a layer when setting off for a redwood hike. Fall is perhaps the best mix of sunny weather and fewer crowds. As is the case with all national parks, pets are prohibited in most areas. Pets on a leash no longer than 6 feet are allowed in campgrounds, picnic areas, parking lots, and on roads. They are also allowed on a leash on Crescent, Gold Bluffs, Hidden, and Freshwater beaches, though dune habitat is off limits. Largest aggregation of old growth coast redwoods in world. Tallest living organism. Walking among these massive giants is truly an unforgettable experience.